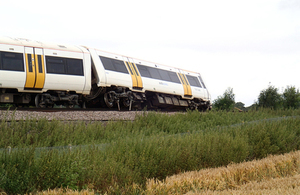 At around 21:40 hrs on 26 July 2015, a passenger train derailed after striking eight cows that had gained access to the railway at Godmersham in Kent, between Wye and Chilham stations. There had been a report of a cow on the railway an hour earlier, but a subsequent examination by the driver of the next passing train did not find anything. There were no further reports from other trains that passed before the accident occurred. The train involved in the accident was travelling at 69 mph (111 km/h) at the point of impact. There were 67 passengers on board plus three members of staff; no injuries were reported at the time of the accident. Because the train’s radio had ceased to work during the accident, the driver ran for about three-quarters of a mile towards an oncoming train, which had already been stopped by the signaller, and used its radio to report the accident. The accident occurred because the fence had not been maintained so as to restrain cows from breaching it, and because the railway’s response to the earlier report of a cow on the railway side of the fence was insufficient to prevent the accident. In addition, the absence of an obstacle deflector on the leading unit of the train made the derailment more likely. As a result of this accident, RAIB has made five recommendations addressing the fence inspection process, clarification of railway rules in response to reports of large animals within the boundary fence, the fitting of obstacle deflectors to rolling stock (two recommendations), and the reliability of the train radio equipment. RAIB has also identified two learning points for the railway industry, relating to the railway’s response to emergency situations, including the response to reports of large animals within the boundary fence and the actions to take following an accident.